Authoritarian parenting is a parenting style characterized by high demands and low responsiveness. Parents with an authoritarian style have very high expectations of their children, yet provide very little in the way of feedback and nurturance. Mistakes tend to be punished harshly. When feedback does occur, it is often negative. Yelling and corporal punishment are also commonly seen in the authoritarian style. During the 1960s, developmental psychologist Diana Baumrind described three different types of parenting styles based on her research with preschool-age children. One of the main parenting styles identified by Baumrind is known as the authoritarian parenting style. Authoritarian parents have high expectations of their children and have very strict rules that they expect to be followed unconditionally. According to Baumrind, these parents "are obedience and status-oriented, and expect their orders to be obeyed without explanation." People with this parenting style often utilize punishment rather than discipline but are not willing or able to explain the reasoning behind their rules. Baumrind believed that one of the major roles that parents play in a child's life is to socialize them to the values and expectations of their culture. How parents accomplish this, however, can vary dramatically based upon the amount of control they attempt to exert over their children. The authoritarian approach represents the most controlling style. Rather than valuing self-control and teaching children to manage their own behaviors, the authoritarian parent is focused on adherence to authority. Instead of rewarding positive behaviors, the authoritarian parent only provides feedback in the form of punishments for misbehavior. Authoritarian parents tend to be very demanding, but not responsive. They have lots of rules and may even micromanage almost every aspect of their children's lives and behaviors. Such rules apply to almost every aspect of life, from how kids are expected to behave in the home to how they should act in public. Additionally, they also have many unwritten rules that kids are expected to follow—even though these children receive little to no explicit instruction about these "rules." Instead, children are simply expected to know that these rules exist. They don't express much warmth or nurturing. Parents with this style often seem cold, aloof, and harsh. These parents are more likely to be nagging or yelling at their children rather than offering encouragement and praise. They value discipline over fun and tend to expect that children should simply be seen and not heard. Authoritarian parents utilize punishments with little or no explanation. Parents with this style usually have no problem resorting to corporal punishment, which often involves spanking. Rather than relying on positive reinforcement, they react swiftly and harshly when the rules are broken. They don't give children choices or options. Authoritarian parents set the rules and have a "my way or the highway" approach to discipline. There is little room for negotiation and they rarely allow their children to make their own choices. They have little to no patience for misbehavior. Authoritarian parents expect their children to simply know better than to engage in undesirable behaviors. They lack the patience for explaining why their children should avoid certain behaviors and waste little energy talking about feelings. Authoritarian parents don't trust their children to make good choices. While parents with this style have high expectations and strict rules, they also do not give their children much freedom to demonstrate that they can display good behavior and make good choices. Rather than letting their kids make decisions on their own and face the natural consequences for those choices, authoritarian parents hover over their kids in order to ensure that they don't make mistakes. They are not willing to negotiate. Authoritarian parents don't believe in gray areas. Situations are viewed as black and white and there is little to no room for compromise. Kids don't get a say or a vote when it comes to setting rules or making decisions. They may shame their children to force them to behave. Authoritarian parents can be highly critical and may even use shame as a tactic to force children into following the rules. "Why do you always do that?," "How many times do I have to tell you the same thing?," and "Why can't you do anything right?" are just a few of the phrases that these parents might use on a regular basis. Rather than looking for ways to build their children's self-esteem, these parents often believe that shaming their children will motivate them to do better. Parenting styles have been associated with a variety of child outcomes including social skills and academic performance. Because authoritarian parents expect absolute obedience, children raised in such settings are typically very good at following rules. However, they may lack self-discipline. Unlike children raised by authoritative parents, children raised by authoritarian parents are not encouraged to explore and act independently, so they never really learn how to set their own limits and personal standards. This can ultimately lead to problems when the parental or authority figure is not around to monitor behavior. 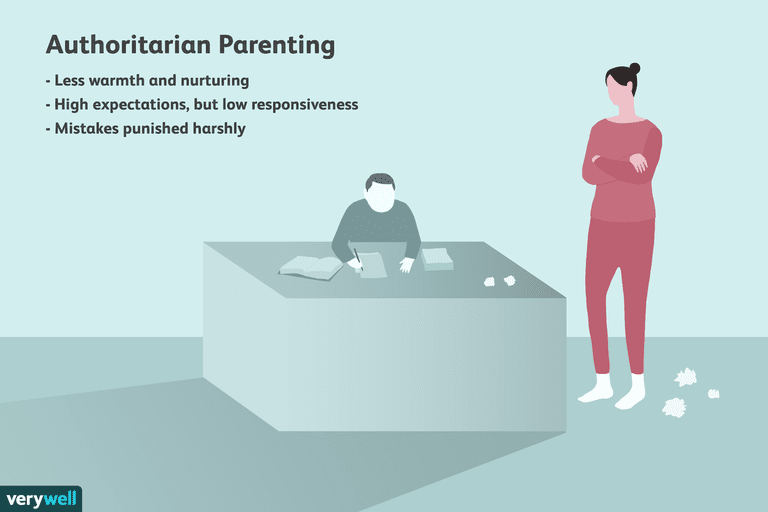 While developmental experts agree that rules and boundaries are important for children to have, most believe that authoritarian parenting is too punitive and lacks the warmth, unconditional love, and nurturance that children need. The authoritarian style is characterized by lots of rules but little parental responsiveness. While an authoritarian approach might be effective in certain situations that require strict adherence to the rules, it can have negative consequences when overused as an approach to parenting. If you notice that your own parenting style tends to be more authoritarian, consider looking for ways that you can begin incorporating a more authoritative style into your daily interactions with your children. Diaconu-Gherasim LR, Măirean C. Perception of Parenting Styles and Academic Achievement: The Mediating Role of Goal Orientations. Learning and Individual Differences. July 2016;49:378-385. doi:10.1016/j.lindif.2016.06.026. Matejevic M, Todorovic J, Jovanovic AD. Patterns of Family Functioning and Dimensions of Parenting Style. Procedia—Social and Behavioral Sciences. August 25, 2014;141:431-437. doi:10.1016/j.sbspro.2014.05.075. Santrock JW. A Topical Approach to Life-Span Development. 7th ed. New York: McGraw-Hill; 2014. Stassen KB. The Developing Person Through the Lifespan. 10th ed. New York: Worth Publishers; 2017.